During the Chicago World's Columbian Exhibition and the Third International Electrical Congress, Alexander Stepanovich Popov of Kronstadt, Russia was a representative of the Russian Torpedo School. Afterward, he worked on his wireless designs. Popov conducted experiments along the lines of Hertz's research. In 1894-95 he built his first radio receiver, an improved version of coherer-based design by Oliver Lodge. In 1895, he built a coherer. Popov constructed a filings coherer, one form of which was used in some surveying experiments by the Russian government. He used early in 1895, the coherer auto-tapping mechanism, and substituted for the galvanometer an ordinary telegraphic relay. He operated this apparatus at a distance by means of a large radiator. One terminal of his coherer was connected to a conductor fastened to a mast about 30 ft. high on the top of the Institute building and the other terminal of the coherer was grounded. Popov presented his radio receiver to the Russian Physical and Chemical Society on May 7, 1895 — the day has been celebrated in the Russian Federation as "Radio Day". 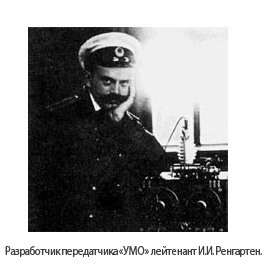 On this day, Popov performed a public demonstration of transmission and reception of radio waves used for communication at the Russian Physical and Chemical Society, using his coherer. The paper on his findings was published the same year (December 15, 1895). Popov had recorded, at the end of 1895, that he was hoping for distant signaling with radio waves. He did not apply for a patent for this invention. Popov's early experiments were transmissions of only 600 yards (550 m). 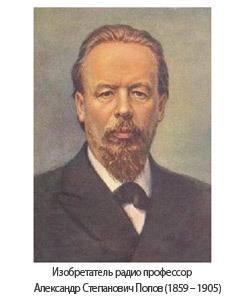 Popov was the first to develop a practical communication system based on the coherer, and is usually considered by the Russians to have been the inventor of radio. In 1895-96 Popov and others utilized the coherer to show the existence of atmospheric electricity, using for the purpose a vertical wire attached to the coherer. On March 24, 1896, Popov demonstrated in public the transmission of radio waves, between different campus buildings, to the Saint Petersburg Physical Society. (This was before the public demonstration of the Marconi system around September 1896.) Per other accounts, however, Popov achieved these results only in December 1897—that is, after publication of Marconi's patent. In 1898 his signal was received 6 miles (9.7 km) away, and in 1899 130 miles (210 km) away. His receiver proved to be able to sense lightning strikes at distances of up to 30 km, thus functioning as a lightning detector. In late 1895, Popov built a version of the receiver that was capable of automatically recording lightning strikes on paper rolls. Popov's system was eventually extended to function as a wireless telegraph, with a Morse key attached to the transmitter. There's some dispute regarding the first public test of this design. It is frequently stated that Popov used his radio to send a Morse code message over a distance of 250 m in 26 March 1896 (three months before Marconi's patent was filed). However, contemporary confirmations of this transmission are lacking. It is more likely that said experiment took place in December 1897. In 1900, Popov stated at the Congress of Russian Electrical Engineers that, "the emission and reception of signals by Marconi by means of electric oscillations was nothing new, as in America Nikola Tesla did the same experiments in 1893 ." Also in 1900, a radio station was established under Popov's instructions on Hogland island (Suursaari) to provide two-way communication by wireless telegraphy between the Russian naval base and the crew of the battleship General-Admiral Apraksin. By February 5 messages were being received reliably. The wireless messages were relayed to Hogland Island by a station some 25 miles (40 km) away at Kymi (nowadays Kotka) on the Finnish coast. Later Popov experimented with ship-to-shore communication. Popov died in 1905 and his claim was not pressed by the Russian government until 1945. 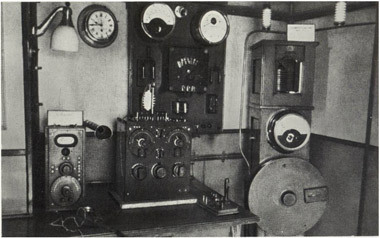 Radio-Room of Russian Cruiser "Aurora" with Transmitter "UMO"
Marine radio was first installed on ships around the turn of the 20th century. In those early days, radio (or "wireless" as it was known) was used primarily for transmission and reception of passenger telegrams. Radio watchkeeping hours were not standardised, and and there was no regulatory requirement for carriage of radio by ships. Indeed, there was a general lack of regulation of the radio spectrum. Amateur/experimental stations often interfered with commercial stations and vice-versa. The most modern passenger liner of the time, RMS Titanic, sank on her maiden voyage after a collision with an iceberg. Some 1500 people perished in the disaster. Fortunately, 700 odd people were saved, thanks mainly to the efforts of the Titanic's two radio officers, who managed to summon help from nearby vessels. However, the vessel closest to the disaster (the Leyland liner Californian) could not be summoned, as her Radio Officer had just gone off watch after 12 hours on duty. The Californian managed to establish communications with other searching vessels after the Titanic had sunk. But by then, it was too late - one thousand five hundred people, including the cream of American and European society, had frozen to death in the North Atlantic. - radio silence periods were introduced. The Titanic disaster also served as the catalyst for the introduction of the International Convention for the Safety of Life At Sea (the SOLAS Convention). The introduction of the first SOLAS Convention was delayed by WW1 - the Convention came into force in the 1920's. During the 1920's, 30's and 40's, marine radio advanced with the technology of the day - radiotelephone operation was introduced, and most importantly, High Frequency (HF) came into widespread use, thereby allowing communications over ever-increasing distances. Of course, marine radio played a vital role in WW2 - the war provided a great boost to radio technology in general. Amongst other things, WW2 introduced direct bridge to bridge communications, through the use of what was to become the marine VHF radio band - known during the war years as "talk between ships" (TBS). After the war, Marine Radio incorporated the latest achievements in electronics - solid state (i.e. : transistorised) equipment and Marine Radar became commonplace. However by the late 1970's, despite tremendous general advances in communications, Morse Code still ruled the marine radio waves. After some 80 odd years of development, marine distress alerting still relied on a human being sitting in front of a receiver. Ship's Radio Officers sent a distress message using Morse Code (or radiotelephone) in the hope that another ship or shore station would hear the call and respond.